Located next to Target Field, the station serves as a central, multi-modal transportation hub and community gathering space in downtown Minneapolis. A catalyst for neighborhood redevelopment, the $79 million design-build project provided 300 new jobs during its construction, and created new community park space for the North Loop neighborhood and historic Warehouse District. The station links 488 trains from light and commuter transit networks, and connects daily bus operation and miles of biking and walking trails linked within the Twin Cities Metropolitan area. The interchange includes an urban plaza with areas for neighborhood bars and eateries, cultural amenities, and entertainment. A great lawn in the upper plaza serves as a central green “stage,” providing new space for pre-game events, community concerts, and seasonal events. Located atop a parking structure, the project provides for 250 additional parking spaces within the transit hub. The landscape and infrastructure are fully integrated, with stormwater cisterns that can hold over 40,000 gallons. 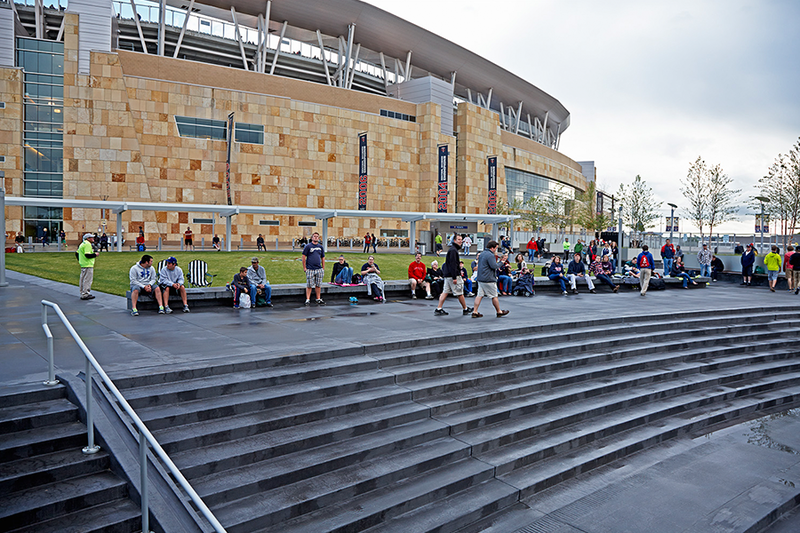 Stormwater filtering and reuse have reduced runoff from the Target Field Station site by 27% and total suspended solids in the runoff by 97%.